This is an updated and revised version of my “Medicinal Frankincense FAQ” from 2 years ago. You can find the original here. Since I have spent the past few years studying and working with Frankincense resin, essential oils, extracts, trees and harvesters, my knowledge on the subject is a little more than average. If I am considered an expert in this area it is a relative thing. I continue to learn and grow daily, as do you, as do the recognized “experts” in any field. I mention this because as a group, we tend to be complacent, seeking and accepting authority and “expert” opinions online without question. This is one way we give away our power and effectiveness in the world. I urge you to research and study all topics independently and reach your own conclusions. Take the time and do it right. Read the fine print. Don’t blindly trust anything you read online. Not even what I write here. Just in case you don’t have the patience to read all the way through, let me tell you now that the anti-cancer and anti-inflammatory Boswellic acids are not present in the essential oil of Frankincense. 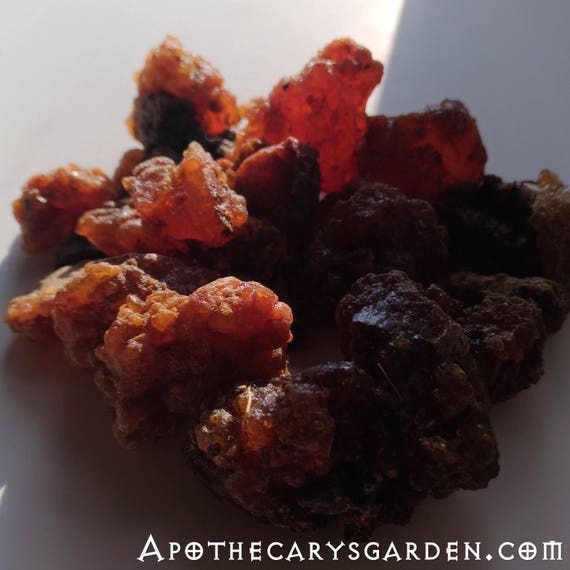 In fact, in Traditional Chinese Medicine, the resin of Frankincense is “cooked” to remove the essential oil before it is added to a formula or taken internally. It looks like the popular belief that Frankincense essential oil cures Cancer is a myth started by one of the large essential oil companies. Whether intentionally or unwittingly, this bit of misinformation is perpetuated by companies and individuals who sell Frankincense essential oil. If you don’t take the time to drill a little deeper into their claims, links and references you can easily purchase the wrong product for your needs which will only benefit the vendors. There are 2 types of misleading studies that are referenced by those who sell Frankincense essential oil. One set describes how “Frankincense oil” kills cancer cells and many people assume they mean Frankincense essential oil, which is not the case. The Frankincense oil in the studies they refer to in many online shops is either a solvent extraction of whole Frankincense oleoresin that includes the Boswellic acids, or an essential oil to which the resin and Boswellic acids have been added. The essential oil of Frankincense contains no anti-cancer Boswellic acids. The only way to benefit from the Boswellic acids is to utilize the resin of Frankincense, not the essential oil. The other set of contradictory studies that claim Frankincense essential oil kills cancer are authored by a core group of people at the head of a large essential oil company. These “studies” directly contradict the hundreds of other research papers that indicate only the resin of Frankincense contains cancer killing Boswellic acids. Not the essential oils. I urge you to look more closely at these studies and their authors. With a growing, ageing western population, a worldwide increase in chronic inflammatory diseases and cancer, the need for “natural” anti-inflammatory and anti-cancer remedies has skyrocketed the past few decades. Big Pharma, corporations and companies that market herbs, supplements and essential oils, online advisors and private health authorities are all on board making the most of this trend. It is important to keep in mind that their primary function is to sell us products, not educate us. Frankincense essential oil is no more anti-cancer than many other essential oils. 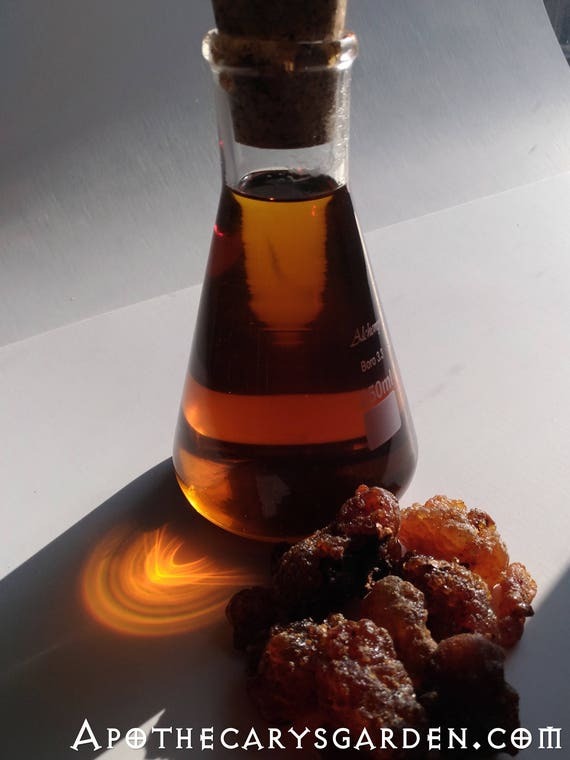 Frankincense resin however, contains Boswellic acids which show broad anti-cancer and anti-inflammatory activity in the laboratory and have been used in traditional medicine for thousands of years. To benefit from these healing compounds one must use the resin of Frankincense. Not the essential oils. There are no Boswellic acids in the essential oil of Frankincense. In fact, powdered whole Frankincense resin has many times more Boswellic acids by weight than any essential oil of Frankincense. Finely ground Frankincense Papyrifera from Ethiopia. Used as is or a base for tinctures, oils, salves and cremes. A short answer is- Frankincense and Myrrh are the oleo gum resins exuded by the Boswellia and Commiphora trees respectively, 2 members of the Burseraceae plant family which is sometimes dubbed “The incense tree family”. They all have a network of resin-bearing ducts that produce and distribute fragrant oleo gum resin. When these trees are damaged the oleo gum resin rises to the surface of the tree where it dries and is collected. Boswellia Carterii trees in the mountains of Somalia. Myrrh tree in Ethiopia sharing its gifts. Frankincense and Myrrh have been used for medicine, perfume and incense for thousands of years. Where they grow is what I like to call the Boswellia Belt which reaches from the West coast of Africa, through the horn of Africa and southern Arabia up through India to Pakistan. There are 17-18 types of Frankincense trees at last count but only 8 or 9 of them provide us with a marketable resin. 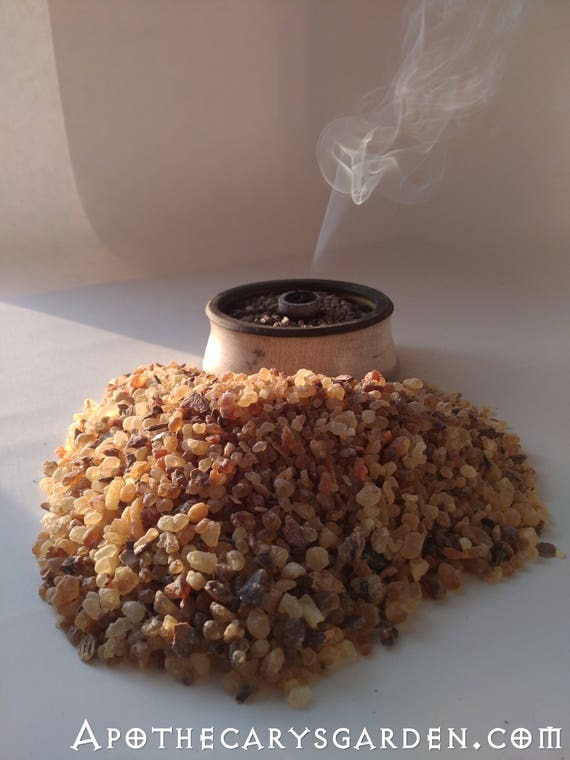 What are the traditional uses of Frankincense? Off the top of my head, a short list of traditional therapeutic applications associated with Frankincense would include- treating arthritis, rheumatism, ulcers, asthma, bronchitis, gastrointestinal disorders, tumours, cancers, infertility, moods, anxiety/depression and memory loss, improving brain function, addressing ageing skin and flagging libido. Frankincense Serrata is used traditionally, whole, in powder, pill, poultice and oil, for arthritis, rheumatoid arthritis, osteoarthritis, asthma, ulcerative colitis, bronchial issues, various cancers and as an ingredient in skincare and beauty products. It can be made into an oil, lotion or creme for external applications. In Arabia Frankincense has been chewed for millennia for oral care, ulcers and general physical/mental well-being. It has been used as an aphrodisiac and to treat infertility in both men and women. It is taken sometimes as a tea steeped in boiling water overnight and sipped during the day for inflammations, coughs, congestion, and colds. In traditional Iranian medicine, Frankincense is still consumed by pregnant women to increase the intelligence, (and bravery), of their offspring, and is generally considered to contribute to one’s mental acuity, emotional stability and spiritual clarity. It is sometimes used as a general tonic and restorative. Though Boswellia Frereana from Somalia does not contain Boswellic acids, it is also a powerful anti-inflammatory used traditionally to treat inflammations of joints, the GI tract and arthritis. Laboratory studies show it can reduce brain inflammation due to tumours, head injuries and stroke. It kills the H.pylorii bacteria which causes stomach ulcers. It is valued as a traditional high-end chewing gum for oral and gastrointestinal health and is one of the most expensive Frankincense types available. Boswellia Papyrifera from Ethiopia/Eritrea/Kenya and Sudan, which is a source of Boswellic acids, also contains Incensole acetate which is considered a psychoactive compound that crosses the blood-brain barrier, reducing anxiety and eliciting feelings of heightened spirituality and well-being. The incensole and Incensole acetate are delivered to us when using the whole oleoresin internally, through pyrolysis, (burning as an incense as is done in many churches), and when using the diluted essential oil externally. Boswellia Thurifera from the shores of the Red Sea has been shown in the laboratory, to increase the size of rat testicles and raise their sperm count. Whole Frankincense, not the essential oil of Frankincense, has been used in the Traditional Medicine systems of Asia, Europe, Arabia and Africa for thousands of years. One group of compounds in Frankincense has shown powerful anti-inflammatory and anti-cancer activity in laboratory studies. They are the Frankincense resin acids which are pentacyclic triterpenes and formally named Boswellic acids since they are found in the Boswellia, or Frankincense family. Though there are other therapeutic compounds and acid resins in Frankincense, the Boswellic acids have caught the eye of big Pharmaceutical companies who are investing in the research. Pure resin acids of Frankincense Papyrifera, (bottom), and Frankincense Carterii. Left behind after distilling their essential oils. This is where the good stuff is!! All types of Frankincense are composed of varying proportions of water-soluble gum, resin, and essential or volatile oils. These resins and volatile oils are lipophilic, (Fat soluble), and mostly dissolve in vegetable oils, alcohol and petroleum distillates. Resin acids make up most of the resin portion of these oleo gum resins and Boswellic acids are the main type of resin acids found in Frankincense. These resin acids make up the non-volatile portion of Frankincense, which means they cannot be distilled or found in the essential oil of Frankincense. Boswellic acids have been found to inhibit leukotriene synthesis and act as anti-inflammatories. They modulate/regulate the behaviour of Leucocytes which are one of the body’s responses to trauma which create inflammation and subsequent pain.(http://bme.virginia.edu/ley/). This makes them valuable in the management of pain. Though one resin acid in particular, AKBA or acetyl-keto-beta boswellic acid has been the focus of anti-cancer studies, it is only one of many resin acid compounds in Frankincense that have their role to play and indeed likely play more effectively together than separately. To be clear, if a little repetitive, Boswellic acids are only present in the resin portion of these oleo-gum-resins, not their essential oils. Though all essential oils have therapeutic properties, the essential oil of Frankincense contains only trace amounts of Boswellic acids. https://en.wikipedia.org/wiki/Boswellic_acid. You can literally knock yourself out with Frankincense essential oil without getting a meaningful amount of Boswellic acids. Which types of Frankincense contain Boswellic Acids? So far, research has shown the resins of the following species of Frankincense contain Boswellic acids. Boswellia Papyrifera-Ethiopia, Eritrea, Kenya, Uganda. It is more than likely that most other types of Frankincense contain Boswellic acids. Many have not yet been studied or analysed. In my opinion, there is no one type of Frankincense listed above that is therapeutically “better” than the other. They mainly differ in their volatile oil composition which contributes to their different aromatic profiles and has nothing to do with their content of resin acids. Boswellia Carterii powdered and prepared for making a range of products. How can we best use Frankincense and the Boswellic acids for their therapeutic properties? To benefit from the therapeutic actions of the Boswellic acids, we must work with the oil/alcohol soluble resin portion of Frankincense. Here is a list of products that will deliver the Boswellic acids with instructions for preparing your own. A Boswellic acid extract. There are a growing number of extract brands on the market. I can’t recommend one over the other. An alcohol tincture of Frankincense. A tincture can be taken directly, or added to food or beverages. A tincture of Frankincense made with 96% alcohol will deliver the resin and essential oils of Frankincense while a tincture that has a lower alcohol content will contain a relative proportion of water-soluble gum. Each has its benefits. Be aware that Glycerin does not act as a solvent for the resin and only an alcohol tincture will contain the important bits. Learn how to make different tinctures from Frankincense here. Negotiating a fair price for Frankincense with the Samburu women who are the main collectors of the fragrant resin. The Samburu women were getting a kick and a giggle over my single pierced ear. The Samburu warriors have 2 pierced ears outfitted with plugs. A white man with a single big tunnel was a constant source of entertainment for the tribe and a great icebreaker. Samburu women. They are all gorgeous! Thousands of square miles of mixed Commiphora/Acacia bushland where many varieties of Myrrh are found. I’m really glad you asked. We are quickly losing our aromatic and medicinal plants around the world through mismanagement. If we don’t start addressing this, future generations will have no Frankincense or Myrrh. If we made educated and responsible choices as global consumers, we could have a huge impact on the world, improving the environment, the health of our flora and fauna and the quality of life of those who tend to this big Apothecary’s garden that supplies all our natural medicine. This can happen lightning fast if enough of us care to make a difference. The demand for Frankincense essential oil is putting an increasing stress on the trees that produce them and on the harvester communities that collect them. The increased market demand for these medicinal and aromatic oleoresins is already exceeding the amount trees can comfortably supply in some areas. Over-harvesting, improper harvesting methods, agricultural encroachment, fires and grazing animals, have reduced the number of mature trees in the wild, the viability of their seeds, and the ability of trees to reproduce. If I recall correctly, seed germination rate has fallen from 81% to 18% in over-tapped trees. This is alarming. There are areas in Kenya, Somalia and Namibia where Frankincense and Myrrh trees are not tapped and the oleoresins are sustainably collected. These are traditions and practices that need to be encouraged especially through preferring these sources to those where trees are heavily tapped. Another critical issue that we are ignorant of is the quality of life of the harvesters. These often remote and isolated communities are the true stewards of our medicinal and aromatic resources. In many communities, these trees are an integral component of socioeconomic structures and are treated with reverence and respect. These are the traditions and communities we need to encourage and support. Frankincense and Myrrh trees are extremely easy to propagate. Large branches will spring into root with barely a word of encouragement. Planting and stewarding new trees in the wild would ensure a sustainable and lucrative future for the harvesters and guarantee the consumer an ethical, fair trade and sustainable product. How perfect is that! The market for Frankincense and Myrrh resins and essential oils is only going to grow. We need to apply a little forethought and foresight now in establishing conservation and stewardship programs before it is too late. There are many ways you can contribute to establishing healthier trade in these resins. Foremost by educating yourself, making informed choices and informed purchases. Ask your supplier whether their Frankincense is sustainably harvested and fairly traded. If we all demand this from our herb and resin providers they will do their best to comply. I really enjoy your posting. I am however pretty computer illiterate. I like hard copies. Is there an easy way to print this (printer friendly), or do you have this information in a form that can be purchased. Thank you for your time. I’m no expert either, however, I would try right-clicking with your mouse and selecting “Print” from the subsequent menu. It’s a bit crude, but works. You could try right-clicking your mouse while on the page. You can then press “Print” on the subsequent mouse menu. In your opinion, what effects might frankincense have on kidney function? Also, might it be beneficial to kidneys; i.e., prevent kidney stones? Hi Jackie. I haven’t come across any studies on Frankincense’s effects on kidney function. I don’t know enough to comment on its effect on kidney stones. Sorry. Your teachings are amazing! I made a salve, using Boswellia Carterii resin, following your instructions to melt the resin…wow!! it has helped my mother in law with her knee pain, my husband with his nail fungus, and a few others that i randomly gave out for other pains. It has been a fascinating learning journey. Yes, chewing the resin for oral and overall health has been practised for hundreds if not thousands of years in many cultures. I think you are on the right path and if I was to add any advice I would only say keep it up, use it consistently and pay attention to its effects over time. If you find it does help, you could also explore other methods of using the resin such as Frankincense tea or taking powdered Frankincense daily. Keep clear notes, listen to your body and cultivate your own personal daily regime. Thank you for the wonderful info on Frankincense. I truly appreciate it. I have some frankincense resins but they are over five years old. Still smells wonderful but is it still useful? Also I am a birth doula and I’m very curious about the Iranian women chewing on the resin while pregnant. Everywhere online I see caution against the essential oil but nothing about the resin. I would love it if you could direct me to an source to gain more wisdom, knowledge and understanding of the use of frankincense resins during pregnancy because it seems like the frankincense resin adapts to situations that would supports healing wherever and whenever it is needed. Your Frankincense resin is likely still in great shape and eminently useable, especially if you still detect an aroma. It takes a long time in harsh conditions for it to deteriorate in any meaningful way. Using the whole natural resin of Frankincense, one bypasses the danger of taking highly concentrated essential oils internally. The only source I know of more information on the topic of Women’s health, Pregnancy and Frankincense consumption is online where you might find some pertinent information. Here are links to studies I have collected over the years. There may be new information online, but these should get you started. If any of the links don’t work please let me know and I’ll see what I can do from my end. Hello! I read in a comment previous to mine that if you had cancer, you would take frankincense in powder form. Why powder form as opposed to utilizing your method for frankincense extract? Thanks! Thank you, that is an excellent question! First of all, for me, this is an exploration with so much yet to discover about the medicinal benefits of Frankincense that there is little that is definitive and incontrovertible. I don’t know that taking the powder is more or less effective than taking the infused oil. However, my theory, (currently), is that the water soluble gum that is present in the whole Frankincense may be of benefit and serve a purpose that we are missing in our pursuit of the isolated, proven active compounds in our natural medicine. A type of pharmaceutical purism that may be blinding us to the benefits of using the whole plant material. It strikes me that the compounds in the water soluble gum may help create an emulsion in our digestive system when the whole Frankincense is taken as a powder. If so, I wonder if this emulsion might facilitate the breakdown and absorption of the oil-soluble resin acids in the bloodstream. When Frankincense resin comes out of the tree it is a thin white liquid. Its colour is what gave it its name Levonah in Hebrew and Luban in Arabic. It has a white colour because the fresh Frankincense is an emulsion, a homogeneous, colloidal blend of the oil soluble resin and essential oil with the water soluble gum. My theory at the moment is that the water soluble gum still has all the compounds that created the original emulsion and that these compounds can be reactivated in part or whole to create an emulsion in our digestive tract that can be more easily broken down and absorbed by our bodies. This emulsion is seen when a traditional overnight Frankincense infusion is made and may indicate why a water-soluble infusion can be of benefit when the medicinal compounds in Frankincense are all oil soluble. In short, I honestly can’t say that ingesting the powder is more efficacious than ingesting the oil extract. They both deliver the Boswellic acids. There simply has not been enough research done on the subject, or the comparative absorption rates of the two methods. Personally, I like the utility and ease of taking the powder, while my theory about reactivating an oil/water emulsion in the body keeps me powdering more Frankincense. O for a thousand tongues to sing my Great Redeemer’s praise for blessing you to carry this information to us. Thanks a million and continued guidance. Hi Dan, thank you for such wonderful information. I have Boswellia carterii which I am going to do a resin extract from. I was reading and following through your method last week and have since purchased a pan and sieve for the process and now I can’t find the photos, is it me or have they been taken down? There have been some glitches with the Apothecary’s Garden website. I haven’t sorted them all out yet, but I think I got the link for the resin extraction process back up. It is in the top drop-down menu again and titled-Tapping into Frankincense and its Boswellic acids-an easy extraction method. Please let me know if you have any difficulty accessing it or any of my other pages. Thanks Dan, I found the process minus the photos but I should be able to tap into the memory and have a go. Looks like a few links on the blog are broken. I apologize for the inconvenience! I was diagnosed with stage IV breast cancer. I would like to take ansnuae Frankincense. What’s the best way for me to use it to attack cancer? I am in no way a health care professional so I can’t advise you on your health issues. That being said, if I was in your position I would likely take a powder of one of the 4 Frankincense types that has Boswellic acids. (Boswellia papyrifera, B. Carterii, B. Sacra or B. Serrata). I would take a half to 1 level teaspoon with food 3-5 times a day. I would start slow and see how my body responded to it, and if all was good I would start upping the dose. The finer the Frankincense is powdered the more easily the Boswellic and other resin acids will be absorbed in the body. I hope this was of some help. Best wishes on your journey with this and if you have any further questions please let me know. Hey Dan, I’m moving from the US to Malindi, Kenya later this year and I’m extremely excited to be at the heart and home of frankincense. Do you have any recommendations about places to pick up some quality frankincense? Sounds exciting! I hear Malindi is gorgeous!! Though I more familiar with Northern Kenya, I hear there are some excellent resin vendors in Mombasa among the Somali merchants. Best of luck with your move!! Good information and I have a question. I have been making a cannabis infused coconut oil for use as a base for an external salve or balm. Used for pain as my wife and I both have arthritis, it is legal in my State. I make this in the Magical Butter Machine as I find less clean up and I can play with smaller batches than if I use a crock pot. I have been using Essential oil of frankincense and Myrrh in the salve plus other oils. I believe when we use plant material we need to use the whole plant not just a distilled oil. Absolutely! This is a perfect way to add the therapeutic compounds present in Frankincense and Myrrh to your oil. Even an oil made exclusively with Frankincense seems to work wonders on Arthritis. And you are correct in assuming the essential oil of these resins will not deliver all their therapeutic properties to your blend. The finer you grind the Frankincense and Myrrh, the more readily they will give up their resin compounds. Thank you thank you for putting your clear love of this sacred tree into words so that we may learn from this information. If you ever feel like taking some passionate herbalists and tree lovers to Africa please do let me know as I’d love to meet these beings in person. Blessings and thanks again! I hope to organize a group trip to Kenya in the next year or so. I have started a list of people who have expressed an interest in joining me and have put your name on it. So, SO informative! Thank you for this important work.